Deferred Consumption: Return to the Guilded Age? Return to the Guilded Age? Just finished the presidential debate and was surprised at how reasonable both candidates sounded tonight. Because of this similarity, I wanted to provide a little under-appreciated historical perspective. 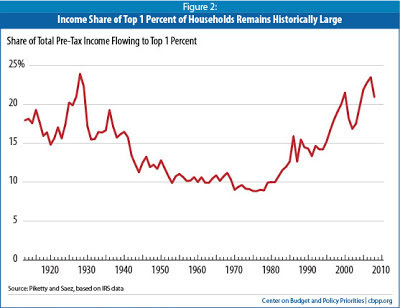 This figure shows the share of total income going to the top one percent. Do you notice the effect of FDR's policies and/or see the middle class being borne in the late 40s? Do you remember who won the election in 1980? Sure, there is some noise in the figure, but the trend seems pretty clear. Why doesn't the middle class generally vote in its economic self interest?